There is nothing like celebration. It is the opposite of having nothing to cheer about. When you watch the way the red, white and blue flag of France, waved in the air on Sunday at Louvre, in celebration of Emmanuel Macron's victory in the presidential election, nothing will be comparable to victory and celebration. The opposite of celebration is a state of loss and it is not what anyone prays for. Imagine the time Hillary Clinton lost the election last year and the coldness that descended upon the the Javits Center, where her supporters had gathered, awaiting the election results. ​ Imagine what happened in 2014 in Nigeria, when over 200 Chibok girls were kidnapped and taken away by Boko Haram terrorists, and the trouble that placed the the Goodluck Jonathan's government. Not even the joy that follows the election of President Muhammed Buhari in Nigeria has dulled the coldness of the kidnapping of the Chibok girls and the whereabouts unknown. The state of Nigeria's economy and the recent sudden illness of President Buhari, lack of disclosure about the president's condition and being incommunicado, have made Nigerians duller. 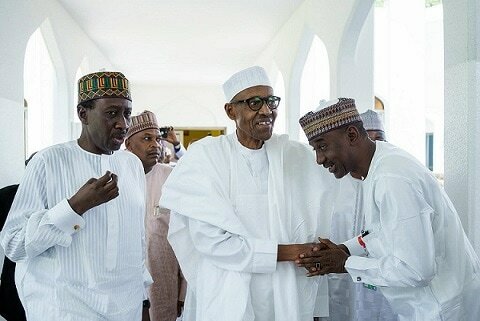 But when President Buhari appeared in the State House Mosque last Friday for prayers, something he was not seeing doing for two weeks, Nigerians dullness was cancelled, because looked like there was nothing much for Nigerians to worry about his health, just as his wife, Aisha, had said few days earlier that her husband's health was not as bad as portrayed in the public. But when President Buhari appeared in the State House Mosque last Friday for prayers, something he was not seeing doing for two weeks, Nigerians dullness was cancelled, because looked like there was nothing much for Nigerians to worry about his health based on the picture her, just as his wife, Aisha, had said, few days earlier that her husband's health was not as bad as portrayed in the public. And while Nigerians still savor the appearance of President Buhari in public after about three weeks of disappearance, the news emerged about the release of additional 82 girls, from the over 200 girls seized by Boko Haram, in 2014. It may not be time for full celebration, but the downcast in Nigeria may have been dulled by these twin developments within 24 hours at the weekend. Undoubtedly, there will be celebrations in homes, where children who were kidnapped and returned after three years will be relocated. There will be some sort of welcome ceremonies at the State House in Abuja for the arriving girls. The ruling party will rejoice and say that it is working to ensure the return of the remaining girls. The development about the girls return may be the natural tonic Buhari requires for full recovery, for him to return to work against gangantuan unemployment rate and the crime wave in the country. Just as it is in France, it is in Nigeria. After these celebrations, there is work to be done. Macron will confront the evil twin of unemployment and terrorism. There is also the evil division in the country, which he has promised to fight with all his strength. The E.U. will have a minimal work to do here. Macron is the French president and the bulks stop on his table. After the celebration with the E.U. over the saving of the latter from further loss of membership, Macron will return to work, to serve both the liberal, conservatives and the moderates. Time will tell whether or not France and Nigeria will be able to sustain the reasons for celebration in both countries. Buhari has got to get well and return to work to do his work, while Macron has said that he has five years to ensure that the extreme political group don't return to work in France.